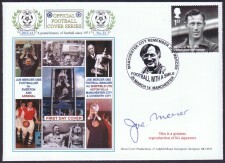 Royal Mail issued a postage stamp in honour of JOE MERCER OBE on 25th March 2014. Dawn Cover Productions commissioned a special handstamp for use on the First Day of issue of the stamp and produced a cover in The Official Football Cover Series. Joe was one of the most respected and popular gentlemen associated with football world wide. His playing career started at EVERTON before going to ARSENAL. He became the Manager of SHEFFIELD UNITED and moved to ASTON VILLA, MANCHESTER CITY and finally COVENTRY CITY. A filler card is supplied with each cover giving some further information about this great man. .